Ok so this was clearly Jay’s idea. Anyone who knows 1. us, 2. Jay, and 3. Jay’s food history knows that he a. grew up husky (ha) and b. loves barbecue sauce. Like, loves it. I like it fine, but I always go for a mustardy or vinegary sauce. Jay, on the other hand, likes the ketchup/molasses-based stuff, preferably out of a jar. Ew. To me, it’s way too sweet, and after a bite or two of anything with that kind of sauce on it I’m all…..WHERE IS ANY OTHER KIND OF FOOD GOOD LORD UGH. It’s really one of the few foods that I just can’t get into in large quantities. But! There are other ways. Ways to make a red sauce that’s sweet but also tangy and smoky, super quick without simmering it all day OR buying a jar of something. 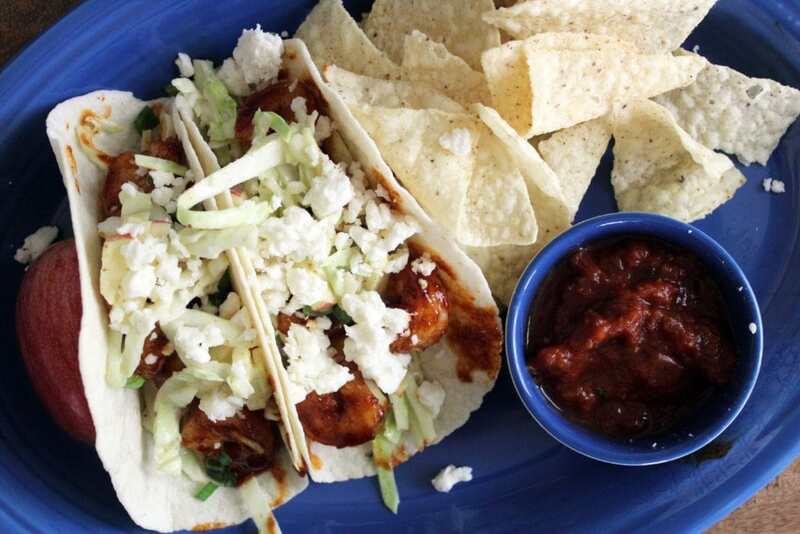 And then you put it on tacos with crunchy vinegar slaw which TOTALLY makes up for the ketchup brown sugar base, and you have a taco. For the tacos, I like flour tortillas, but corn are great too if that’s your preference! Then you’ll need cabbage, honey, apple cider vinegar, an apple, mayonnaise, mustard of some sort, some crumbly white cheese like this queso blanco, and shrimp. Medium, peel them and take off their tails. 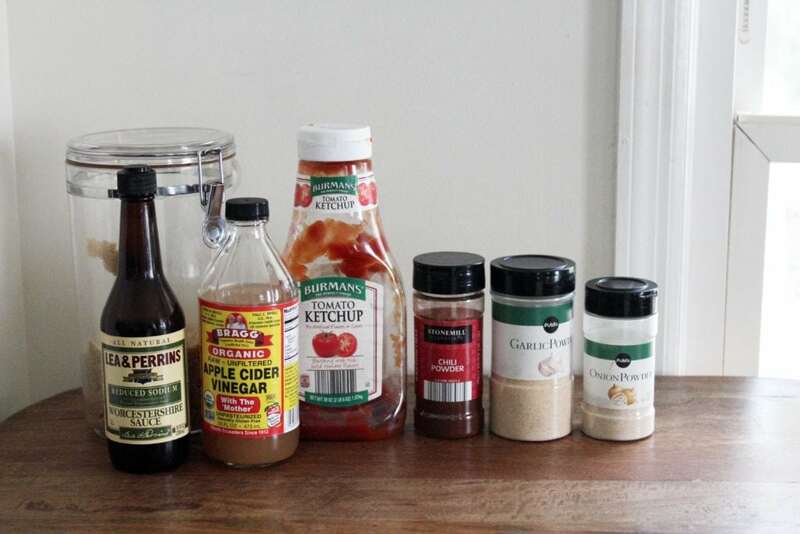 Then for the no-cook barbecue sauce we have brown sugar, Worcestershire sauce, apple cider vinegar, ketchup, chili powder, garlic powder, and onion powder. OBVIOUSLY you could make this sauce and put it on anything your little heart desires, you know what I mean? Ok so let’s make the sauce first. You dump all the ingredients in a bowl. 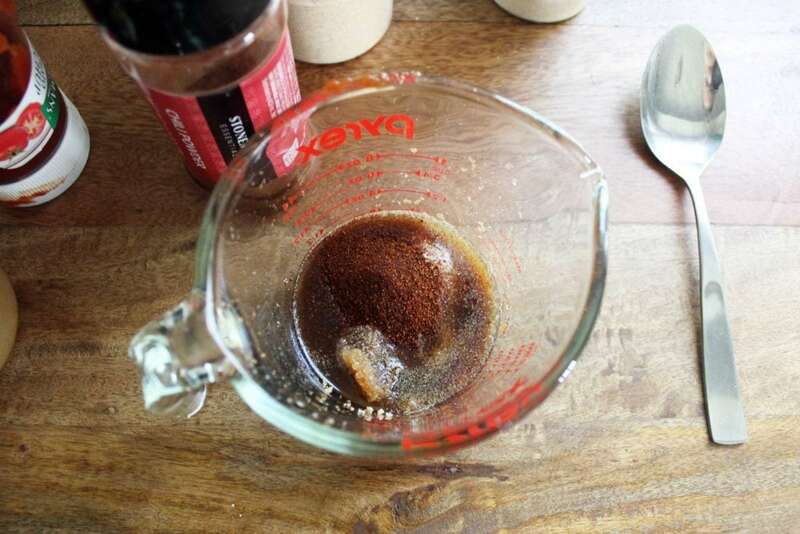 You stir them together to dissolve the sugar and spices a little bit. You taste. Yum! Grainy, but this WILL cook with the shrimp. Add more vinegar if you like a super tangy sauce, or anything else you think it needs. Then, set that aside. Then the slaw! Mix the dressing ingredients in the bottom of a large bowl. 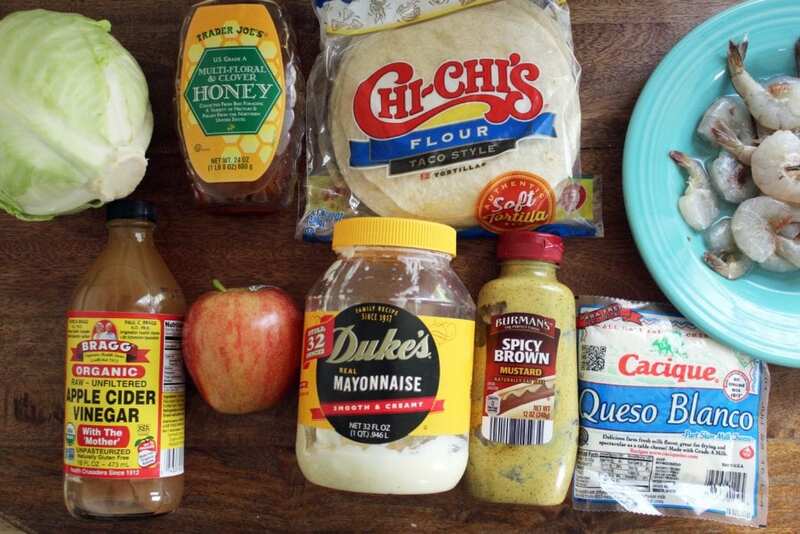 Vinegar, mustard, mayo, honey. YUM. Same thing! Stir. Taste. Adjust. Set aside. 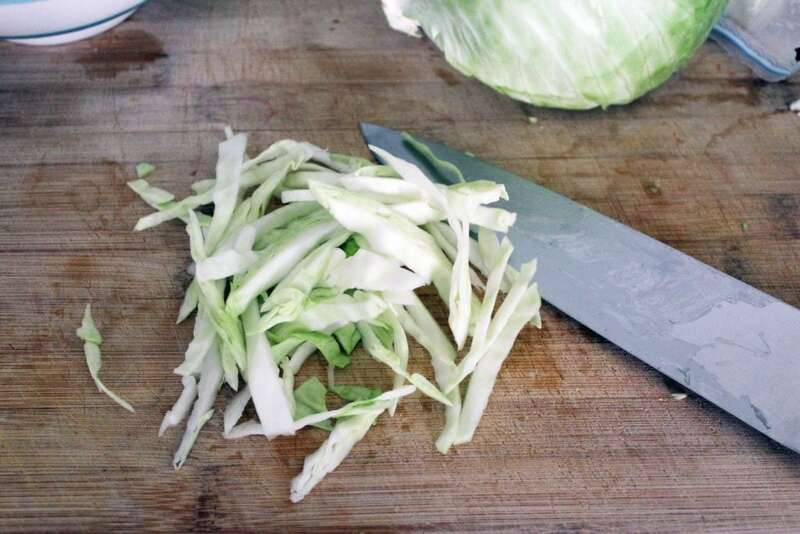 Thinly slice the cabbage – you can use a mandoline for this too. 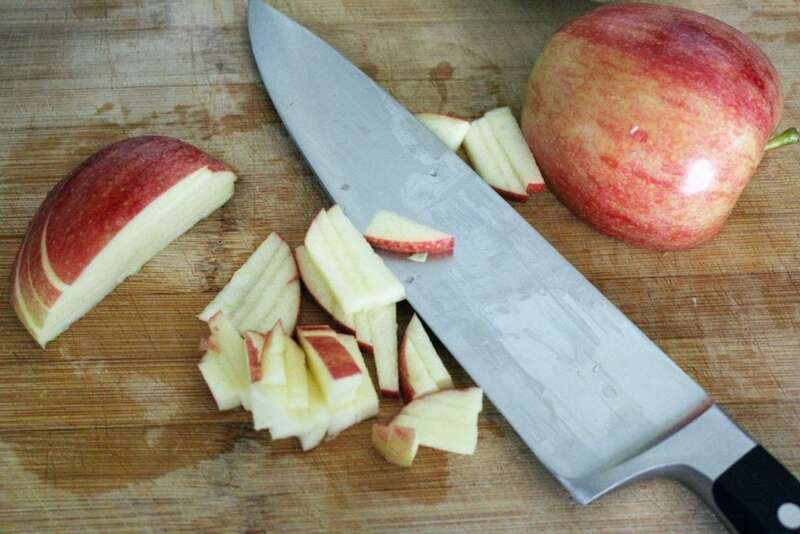 Then, cut the apple into thin slices, and cut the slices into thin strips. 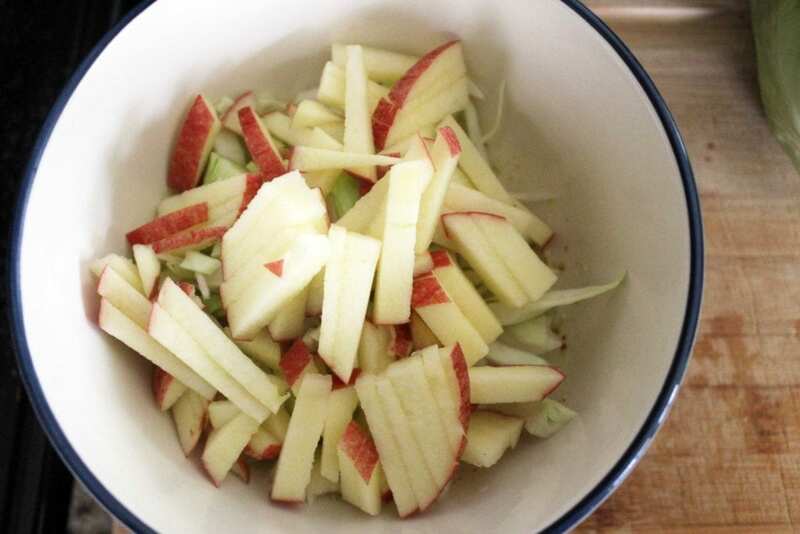 Mix the cabbage and apples into the dressing you prepared. Taste THAT, and add salt and pepper if you’d like. It’s super delish. Now, onto the shrimp! Preheat a skillet to medium-high heat with a drizzle of olive oil. When the pan is super hot, add the shrimp in one layer. 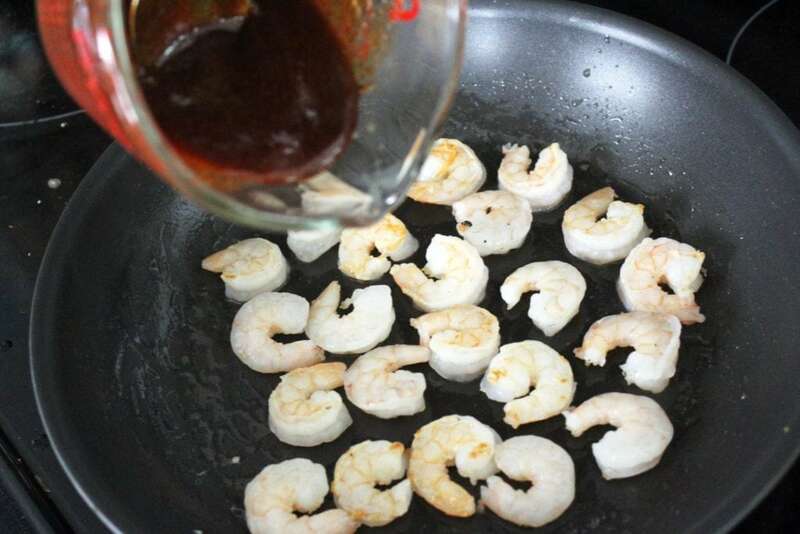 After about 2 minutes, when the shrimp starts to become pink and opaque, flip the shrimp and pour in the barbecue sauce. The sauce will cook and reduce and coat the shrimp and just YES. This is how you eat barbecue sauce, even if it’s not your favorite thing. Now, all that’s left is to build tacos! 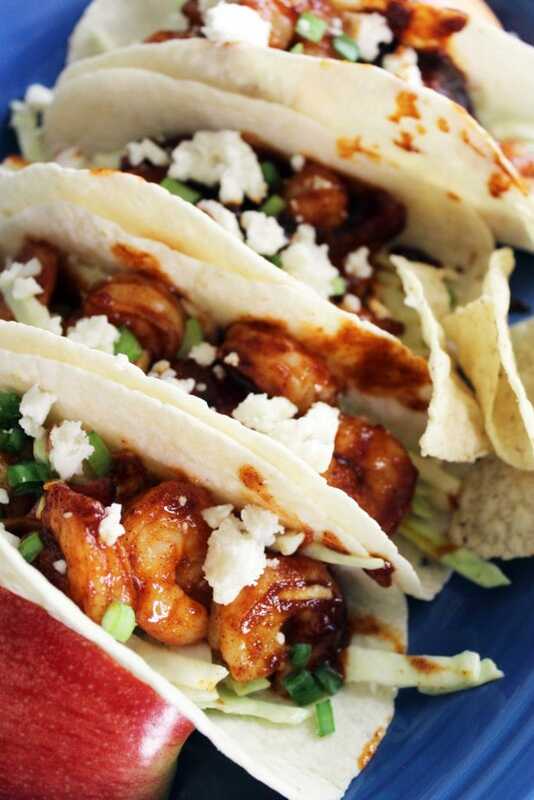 I go taco shell, slaw, shrimp, cheese. 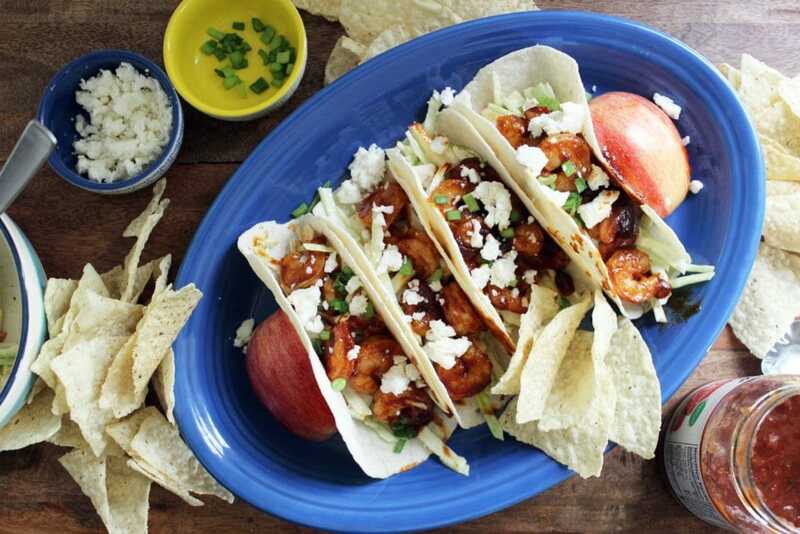 Throw on some cilantro, scallions, maybe lime wedges for serving, and you have this GREAT dinner. PS a taco is like the most balanced meal ever, right? Carb + protein + veg right in one little package. Happy summery food time of year! It’s my fav season. Make the slaw. 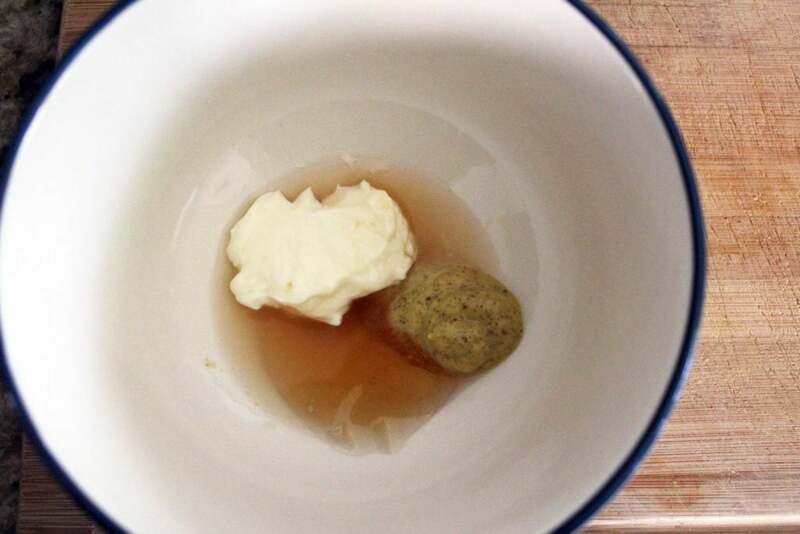 Combine the vinegar, honey, mustard, and mayonnaise in the bottom of a bowl until creamy. Add the apple and the slaw and toss to coat. Taste, and adjust the seasonings of the dressing to your preference. Make the BBQ sauce. Combine all ingredients in a bowl, stirring vigorously to combine. Taste, and adjust seasonings to your preference. Heat a large skillet to medium-high heat with a drizzle of olive oil. 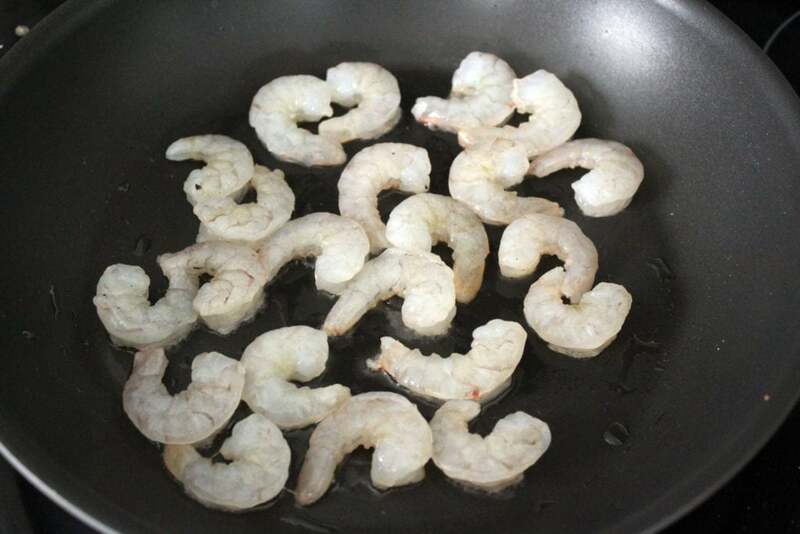 When the pan is hot, add the shrimp in one even layer. 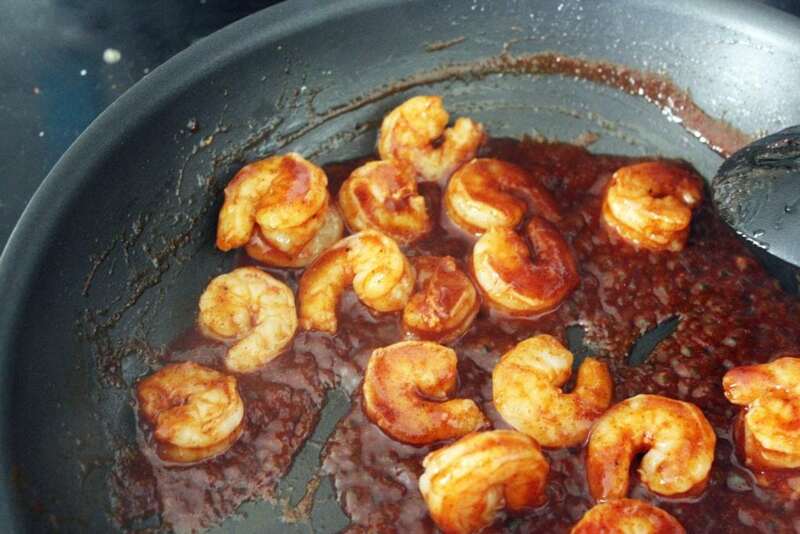 After 2 minutes, flip the shrimp and pour the BBQ sauce into the skillet. Let the shrimp finish cooking for 2 minutes until cooked through and the sauce has reduced. 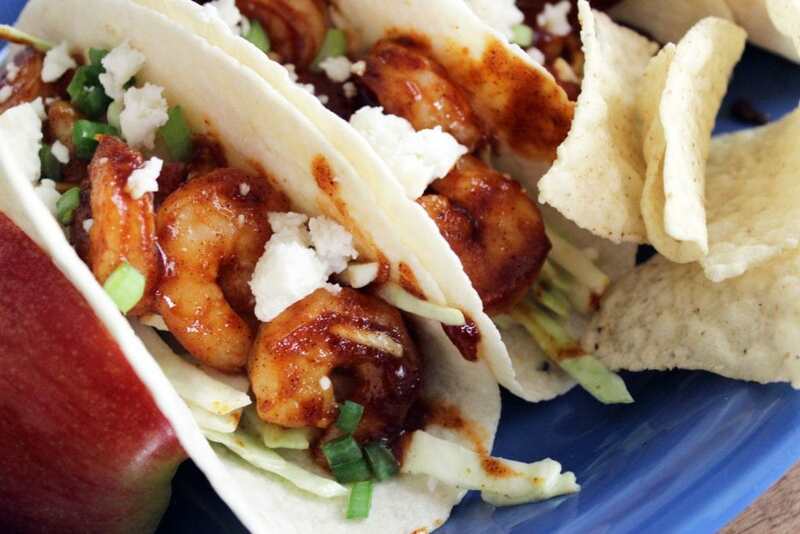 Layer taco shells with slaw, shrimp, cheese, and any toppings you'd like. Enjoy! 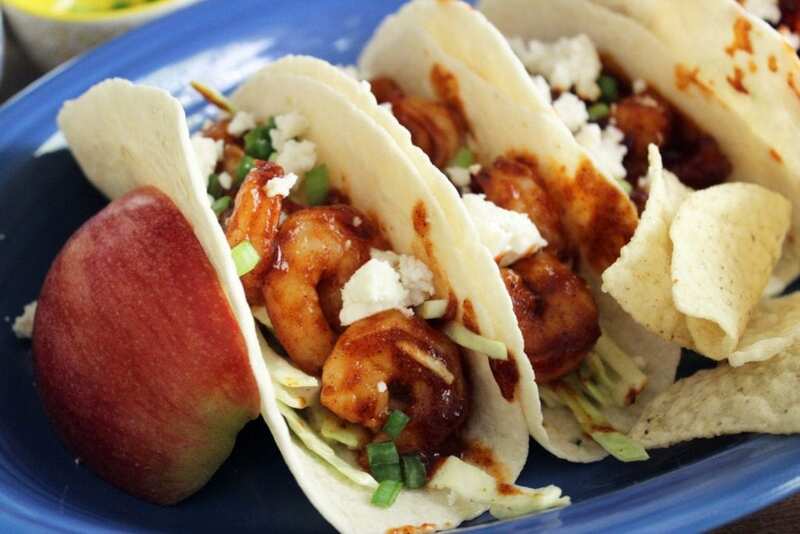 I love how you used an apple to prop the tacos up on the plate for the picture.